The GW4 Wellcome Trust PhD Roadshow explored the changes Wellcome have made to their PhD programmes and showcased the support and resources GW4 offer PGR students and staff. 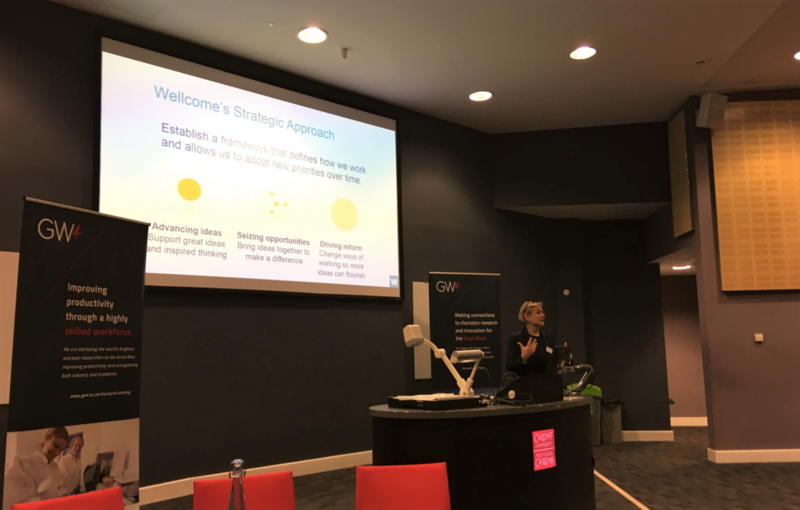 The Roadshow, which took place at Cardiff University on Wednesday 24 October, brought together senior researchers and PhD students from across the GW4 Alliance. GW4 were delighted to host Dr Anne-Marie Coriat, Head of UK and EU Research Landscape at Wellcome Trust, who explained the findings of their 2017 review of PhD training in biomedical research. These findings helped to revise their approach to their new PhD Programmes in Science scheme, which opens this Autumn. The review highlighted key areas to improve the structure and culture of PhD training. These were: flexibility, supervision, skills development, career transitions, publications, diversity and inclusion, and mental health. GW4 has five Wellcome Trust doctoral training programmes led by GW4 institutions. Attendees heard how the four dynamic programmes in science help to provide a positive research culture for students and staff. For example, by offering a range of interesting rotations and projects, regular tutorials, social activities, alumni networks, and career pathways. Staff and students at each institution also benefit from being part of GW4 as a whole, sharing expertise, accessing facilities and resources as well as student-led training provision. GW4 offers a portfolio of postgraduate development opportunities including a training support network for both student and staff, shared equipment database and travel bursaries and will continue to support Wellcome’s objectives for improving researchers’ wellbeing and working environment.